"A great photograph often reveals the city to the people who share its life." On June 26, 1919 two cousins, Capt. Joseph M. Patterson and Col. Robert McCormick, launched The Illustrated Daily News - predecessor to today's New York Daily News. They were the first American newspaper publishers to fully understand the power of photography in journalism, recognizing photographers were as important to covering the news as are reporters. From the first day, the News dispatched Fedora bedecked photographers lugging 4x5 Speed Graphics to document life in Gotham. Every News edition since has strived to use the full impact of photography to communicate the news. Times have changed. Digital SLRs have replaced the Speed Graphics, and - tragically - Fedoras are no longer standard fare. But, bareheaded Daily News photographers still hit the streets every day and night to cover all aspects of New York City life. Since 1919, The News has amassed an amazing collection with millions of photographs. Many News photos are now available in the world's largest online photo database at www.DailyNewsPix.com. 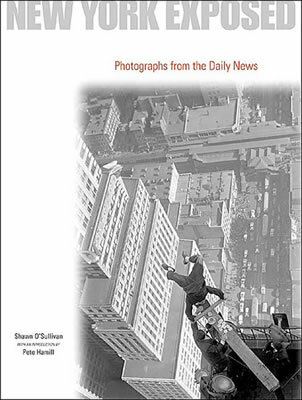 'New York Exposed: Photographs from the Daily News' is a retrospective of the finest of the News's photos from 1919 to the dawning of the new millennium. Daily News Feature Editor Shawn O'Sullivan and former News Editor-in-Chief Pete Hamill, have assembled a collection of images from "New York's Hometown Paper" telling the city's story. Images of soldiers, statesmen, cops, the mob, sports, celebrities, fire and fashion provide a vision of all facets of New York's story.